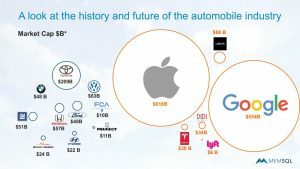 In 10 years, you will likely own or ride in a car from one of these four companies: Google, Apple, Uber and Tesla. The stakes are high and the largest public and private technology companies have set their sights on transportation as the next growth area. The U.S. Bureau of Labor Statistics recently reported that transportation represents 17% of consumer spending, topped only by housing expenses at 33%. Together, Google, Apple, Uber and Tesla pack the biggest threat to established automakers. They have spurred a flurry of deal making, engineering team building, and set a pace for innovation that the automobile industry has not seen for decades. Google has heavily promoted its work with autonomous vehicles and stands to benefit from one of the most aggressive mapping endeavors ever undertaken on our planet. Most recently Google has also expanded a new carpool initiative with its crowdsourced mapping service, Waze in the U.S. Rumors have long swirled around vehicle initiatives at Apple, and the latest reporting details a potential acquisition of the British sport car maker McLaren. Some speculate that the McLaren engineering team’s experience with high-end polymers and carbon fiber could give Apple a leg up in the physical design of the ultimate self-driving electric car. Uber is reinventing business models daily, and frequently leading in self-driving car news. The company recently began its self-driving pilot in Pittsburgh, Pennsylvania, and maintains an aggressive pace pushing into new markets like its August acquisition of Otto, a company focused on self-driving trucks. Tesla is also a leader in autonomous vehicles and is pushing groundbreaking physics with batteries, battery factories and charging stations. It has pursued a vertically integrated approach encompassing an ecosystem that stretches to solar power as well with the SolarCity acquisition. Tesla has shipped more vehicles than any other company among the four horsemen, but still retains an underdog position relative to Apple or Google in market capitalization, and relative to global automakers in shipments. Other companies that could compete on this stage include Amazon, Microsoft and Facebook. None have ventured as far as the four horsemen into vehicles yet. Didi from China is another contender, especially since Asia represents 33% of global car sales. But market capitalization only tells a part of the story. The revenue and vehicle shipments from the traditional automakers still dwarfs anything from the four horsemen. Consider the top three global automakers of Toyota, Volkswagen and General Motors. 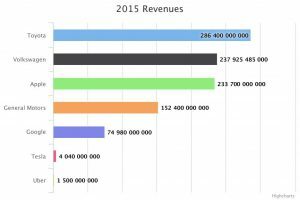 Together they have a combined $676 billion in revenue for 2015. While Apple and Google top $300 billion together in revenue, neither is raking in much money from transportation. 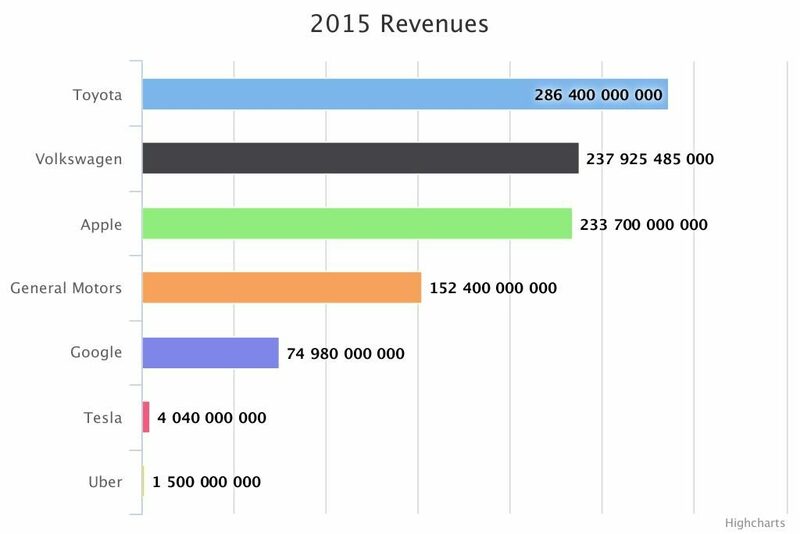 Tesla had revenues of $4 billion in 2015, and Uber approximately $1.5 billion. 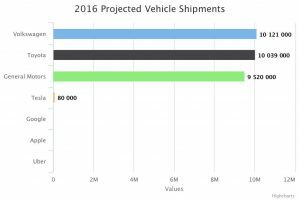 Globally, Toyota, Volkswagen and General Motors are in a near tie to date with almost six million vehicles shipped each in the first seven months of 2016, and a projected 10 million this year. 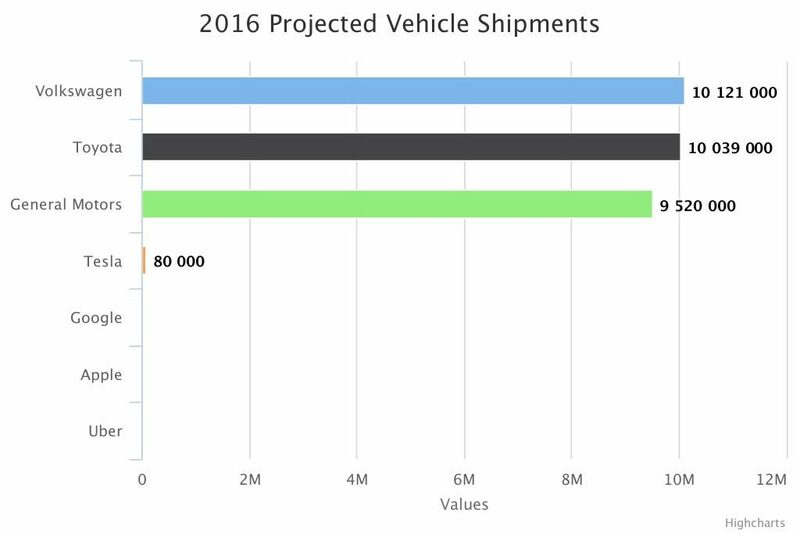 Tesla touts shipments of 30,000 vehicles in the first half of 2016, and aims to achieve 80,000 shipments by year end. As a reference, in 2015 there were approximately 72 million vehicles shipped globally. So there is some work to do before the tides turn completely. 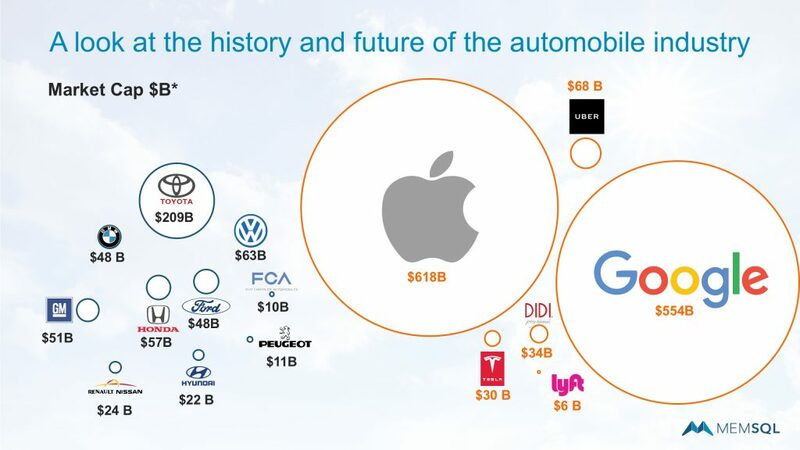 No doubt that Google, Apple, Uber and Tesla have shaken ground in the auto world. We’re likely to see them leading transportation innovation for some time. But the sheer ability to manufacture and distribute millions of vehicles globally is unlikely to be disrupted as quickly. One opening for the newcomers is the low utilization of automobiles today which has been flagged at just 1%. If the industry can fix the utilization gap, with self-driving cars appearing when and where you need them, it may be able to produce 100x fewer vehicles and still satiate demand. Perhaps that is why Apple is poking around McLaren. And perhaps that is why the future of self-driving connected cars will be not just about the software smarts to build them, but the ability to build or buy into a global supply chain of manufacturing and distributing vehicles.